Posted by gordonwatts in ROOT Builder. 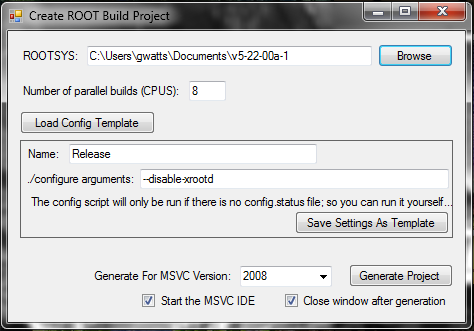 I mentioned a few weeks ago ROOT Builder, an app that allows you to build ROOT on your windows machine fairly easily. It turns out that version worked very well on x64 bit machines, but not so well on good-old 32 bit machines. I’ve fixed that issue now – v1.32 (a one line change of code, duh!). Posted by gordonwatts in ROOT, ROOT Builder. This weekend I took a few hours off and finished up some remaining work on a tool Axel and I created a year ago, ROOT Builder. This is a very small windows utility that is useful if you want to build ROOT from source on your computer.